Download "STUDENT HEALTH INSURANCE FREQUENTLY ASKED QUESTIONS"
1 STUDENT HEALTH INSURANCE FREQUENTLY ASKED QUESTIONS ENROLLING IN THE STUDENT HEALTH INSURANCE PLANS 1. How do I enroll in the Student Health Insurance Plans? Most students will be enrolled automatically in either the Basic or Comprehensive Plan depending on your school program, credit load and visa status. Completing the online enrollment process will ensure that you are enrolled in the plan of your choice. If you were not automatically enrolled and are eligible for the Student Health Insurance Plans, you may enroll through the online enrollment system. Before you access the online system, have your Student ID number handy. 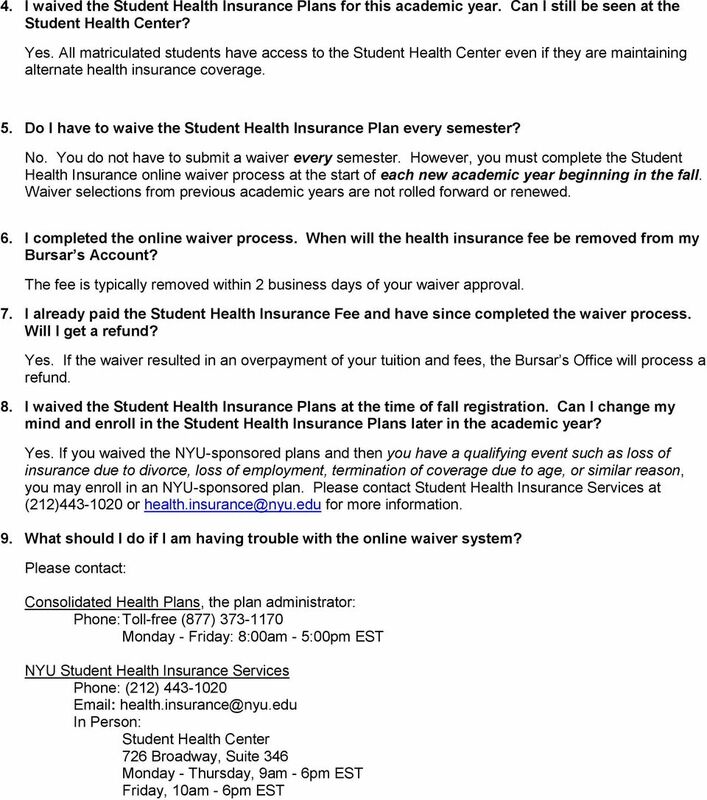 1) Go to the NYU Student Health Insurance website at during the appropriate time period. 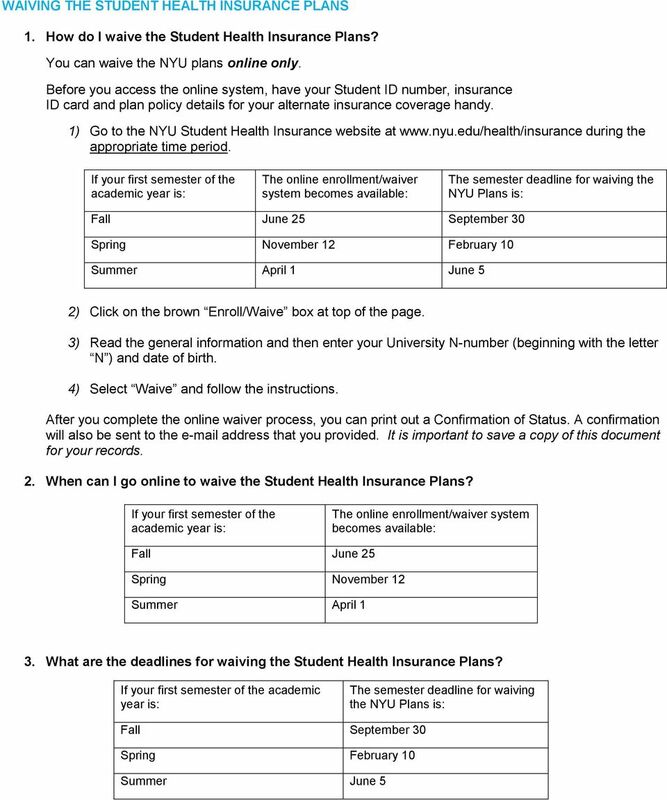 If your first semester of the academic year is: The online enrollment/waiver system becomes available: The semester deadline for enrolling in the NYU Plans is: Fall June 25 September 30 Spring November 12 February 10 Summer April 1 June 5 2) Click on the brown Enroll/Waive box at top of the page. 3) Read the general information and then enter your University N-number (beginning with the letter N ) and date of birth. 4) Select Enroll and follow the instructions. After you complete the online selection process, you can print out a Confirmation of Status. A confirmation will also be sent to the address that you provided. It is important to save a copy of this document for your records. 2. 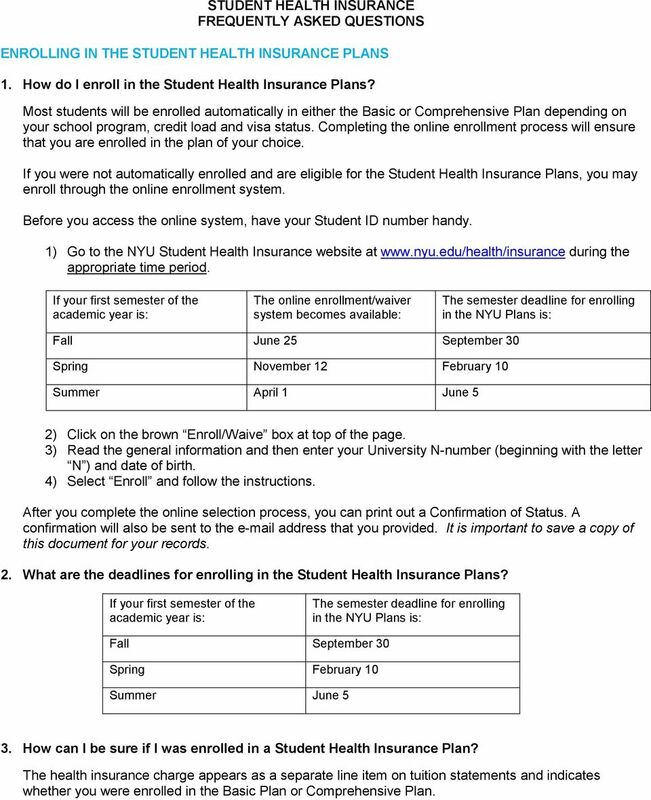 What are the deadlines for enrolling in the Student Health Insurance Plans? If your first semester of the academic year is: The semester deadline for enrolling in the NYU Plans is: Fall September 30 Spring February 10 Summer June 5 3. How can I be sure if I was enrolled in a Student Health Insurance Plan? The health insurance charge appears as a separate line item on tuition statements and indicates whether you were enrolled in the Basic Plan or Comprehensive Plan. 2 4. I was enrolled in a Student Health Insurance Plan last year. Do I have to take action to enroll again for the current academic year? Yes, if you wish to be enrolled in a different insurance plan than your automatic enrollment default plan. Online enrollment selections from previous academic years are not rolled forward or renewed. No, if in the current year you are enrolled automatically in the insurance plan that you prefer. Please note that automatic enrollment is determined by your school program, credit load and visa status, which may vary from year to year. We strongly urge you to enroll through the online system each year in order to ensure coverage in the plan you prefer. To determine your automatic enrollment default plan click here. 5. 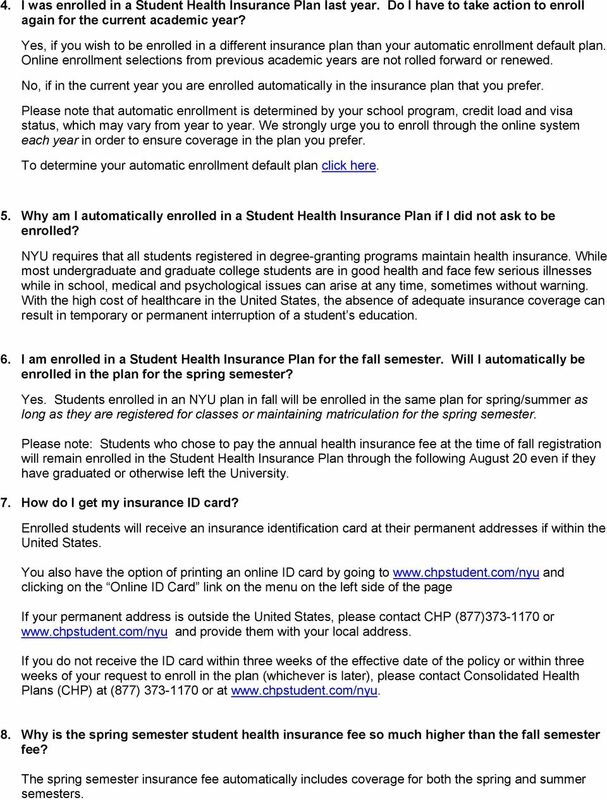 Why am I automatically enrolled in a Student Health Insurance Plan if I did not ask to be enrolled? NYU requires that all students registered in degree-granting programs maintain health insurance. While most undergraduate and graduate college students are in good health and face few serious illnesses while in school, medical and psychological issues can arise at any time, sometimes without warning. With the high cost of healthcare in the United States, the absence of adequate insurance coverage can result in temporary or permanent interruption of a student s education. 6. I am enrolled in a Student Health Insurance Plan for the fall semester. Will I automatically be enrolled in the plan for the spring semester? Yes. Students enrolled in an NYU plan in fall will be enrolled in the same plan for spring/summer as long as they are registered for classes or maintaining matriculation for the spring semester. Please note: Students who chose to pay the annual health insurance fee at the time of fall registration will remain enrolled in the Student Health Insurance Plan through the following August 20 even if they have graduated or otherwise left the University. 7. How do I get my insurance ID card? Enrolled students will receive an insurance identification card at their permanent addresses if within the United States. You also have the option of printing an online ID card by going to and clicking on the Online ID Card link on the menu on the left side of the page If your permanent address is outside the United States, please contact CHP (877) or and provide them with your local address. If you do not receive the ID card within three weeks of the effective date of the policy or within three weeks of your request to enroll in the plan (whichever is later), please contact Consolidated Health Plans (CHP) at (877) or at 8. Why is the spring semester student health insurance fee so much higher than the fall semester fee? The spring semester insurance fee automatically includes coverage for both the spring and summer semesters. 3 9. I am enrolled in a Student Health Insurance Plan for the fall semester. Can I change to a different plan for the spring semester? No. Students cannot change plans after the September 30 th fall semester open enrollment deadline. 10. I am enrolled in a Student Health Insurance Plan for the fall semester. Can I waive the student plans for the spring semester? Yes. If you were automatically enrolled in a plan for the fall semester and did not confirm your selection through the fall online enrollment process, you may waive spring coverage online for the spring semester before the February 10 spring term deadline. If you used the online system in fall to confirm your enrollment and now have a new health insurance plan, you may waive spring coverage by submitting a Petition to Change Insurance form to Student Health Insurance Services before the February 10 spring semester deadline. Please contact Student Health Insurance Services at (212) or for more information. 11. 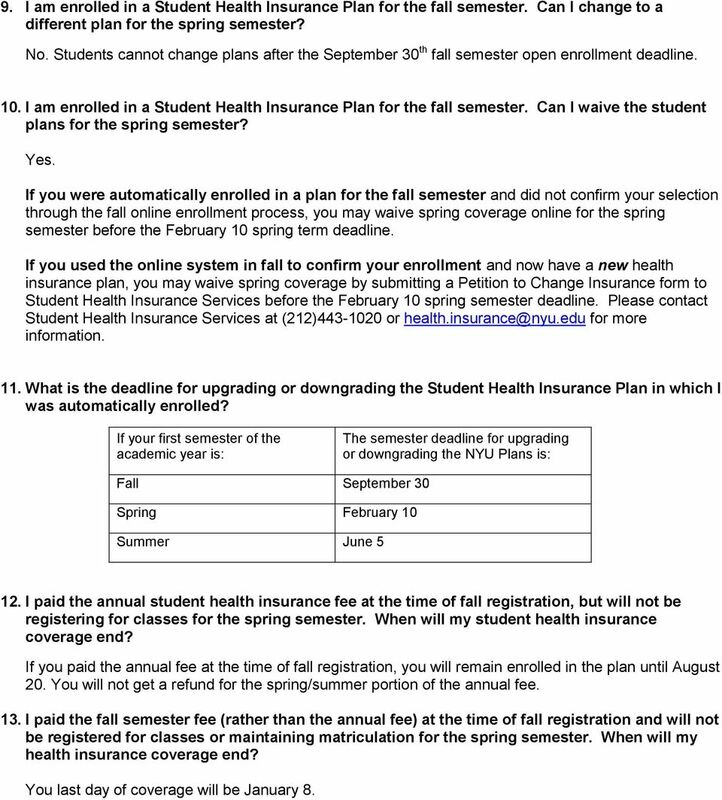 What is the deadline for upgrading or downgrading the Student Health Insurance Plan in which I was automatically enrolled? If your first semester of the academic year is: The semester deadline for upgrading or downgrading the NYU Plans is: Fall September 30 Spring February 10 Summer June I paid the annual student health insurance fee at the time of fall registration, but will not be registering for classes for the spring semester. When will my student health insurance coverage end? If you paid the annual fee at the time of fall registration, you will remain enrolled in the plan until August 20. You will not get a refund for the spring/summer portion of the annual fee. 13. I paid the fall semester fee (rather than the annual fee) at the time of fall registration and will not be registered for classes or maintaining matriculation for the spring semester. When will my health insurance coverage end? You last day of coverage will be January 8. 7 INSURANCE ENROLLMENT FOR LEAVE OF ABSENCE 1. I am going on a leave of absence. Can I be enrolled in a Student Health Insurance Plan? Yes. You are eligible to continue your enrollment in the Basic, Comprehensive and GSHIP plans for no more than a 12-month period IF AND you are on a medical or personal leave of absence approved by the Dean s Office of your school, you were enrolled in the plan during the preceding academic term. 2. 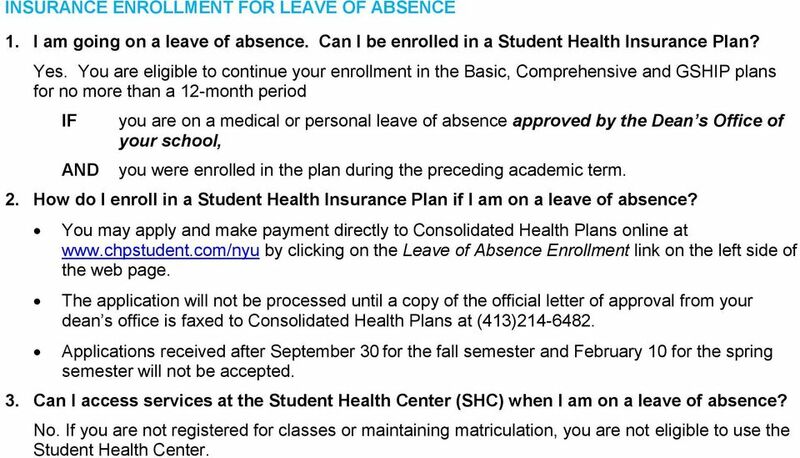 How do I enroll in a Student Health Insurance Plan if I am on a leave of absence? You may apply and make payment directly to Consolidated Health Plans online at by clicking on the Leave of Absence Enrollment link on the left side of the web page. The application will not be processed until a copy of the official letter of approval from your dean s office is faxed to Consolidated Health Plans at (413) Applications received after September 30 for the fall semester and February 10 for the spring semester will not be accepted. 3. Can I access services at the Student Health Center (SHC) when I am on a leave of absence? No. If you are not registered for classes or maintaining matriculation, you are not eligible to use the Student Health Center. 8 INSURANCE ENROLLMENT AFTER GRADUATION 1. I have completed my degree and am graduating. When does my student health insurance coverage end? January Graduates: If you paid the fall health insurance fee only at the time of fall registration, your coverage will end on January 8 and you will no longer have access to services at the Student Health Center beyond that date. If you paid the annual fee at the time of fall registration, your coverage will end on the following August 20, but you will no longer have access to services at the Student Health Center after January 8. Spring Graduates Your coverage will end on August 20, but you your access to services at the Student Health Center will end shortly after graduation. Summer Graduates Your coverage will end on August 20 and you will no longer have access to services at the Student Health Center beyond that date. 2. Can I continue my coverage in the Student Health Insurance Plans after I graduate? Yes. You may opt to enroll in the Continuation Option in order to continue your coverage under the Basic, Comprehensive or GSHIP plans for an additional 1-month, 3-month or 6-month period beyond your student coverage termination date. 3. How do I enroll in the Continuation Option? You may apply and make payment directly to Consolidated Health Plans online at by clicking on the Continuation Option link on the left side of the web page. Applications received after August 31 for the fall semester and January 15 for the spring semester will not be accepted. You will not be able to extend or reduce the coverage period after your initial Continuation Option selection. 4. 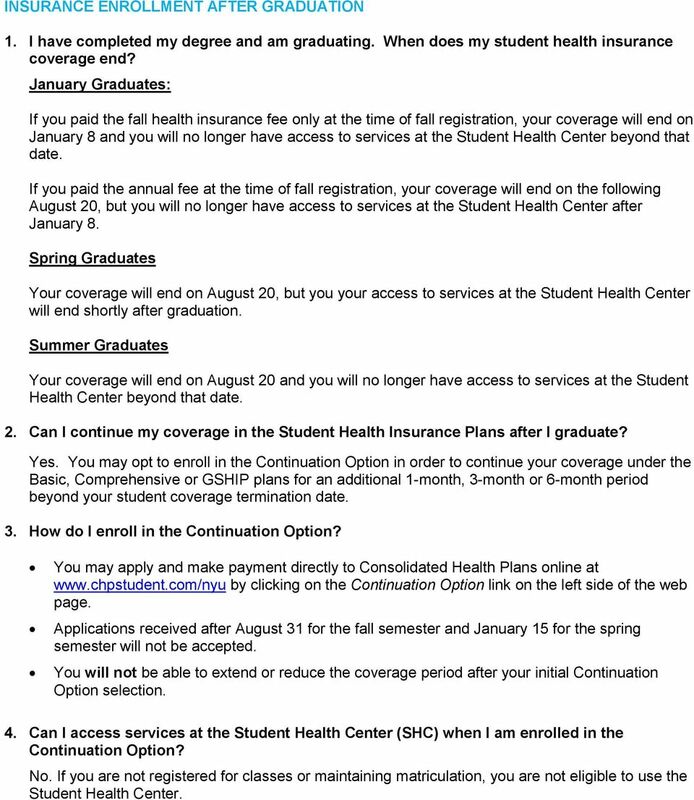 Can I access services at the Student Health Center (SHC) when I am enrolled in the Continuation Option? No. If you are not registered for classes or maintaining matriculation, you are not eligible to use the Student Health Center. 9 REFERRAL REQUIREMENTS FOR THE STUDENT HEALTH INSURANCE PLANS 1. Can I go directly for medical treatment outside the Student Health Center? Students Seeking Services IN Manhattan must first seek treatment at the Student Health Center, located at 726 Broadway. If, and only if, evaluation by an SHC provider determines that you need services unavailable at SHC, you will be given a written, off-site referral. Covered services received in Manhattan without an appropriate referral will not be paid by the NYU plans. Students are responsible for any copay or coinsurance fees incurred, even if they have an appropriate referral. See Referral Requirements for exceptions to this rule. Students Seeking Services OUTSIDE Manhattan Students covered by the NYU plans are encouraged to first seek services by an SHC provider at 726 Broadway, who will be able to supervise and coordinate care at no cost or reduced cost for medically necessary treatment at SHC. If that is not possible, seek care from providers who participate in the MagnaCare or MultiPlan networks to ensure maximum benefits and minimal out-of-pocket expenses. 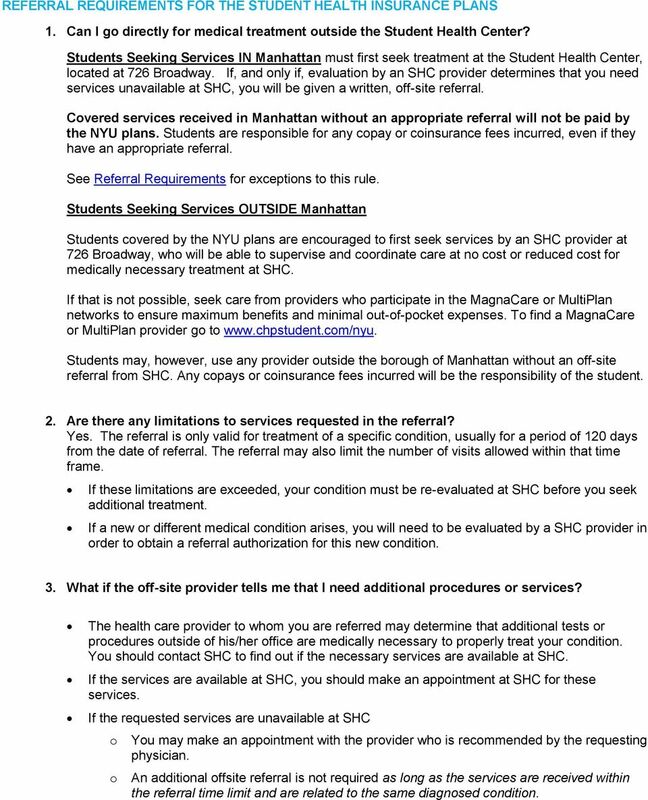 To find a MagnaCare or MultiPlan provider go to Students may, however, use any provider outside the borough of Manhattan without an off-site referral from SHC. Any copays or coinsurance fees incurred will be the responsibility of the student. 2. Are there any limitations to services requested in the referral? Yes. The referral is only valid for treatment of a specific condition, usually for a period of 120 days from the date of referral. The referral may also limit the number of visits allowed within that time frame. If these limitations are exceeded, your condition must be re-evaluated at SHC before you seek additional treatment. If a new or different medical condition arises, you will need to be evaluated by a SHC provider in order to obtain a referral authorization for this new condition. 3. What if the off-site provider tells me that I need additional procedures or services? The health care provider to whom you are referred may determine that additional tests or procedures outside of his/her office are medically necessary to properly treat your condition. You should contact SHC to find out if the necessary services are available at SHC. If the services are available at SHC, you should make an appointment at SHC for these services. If the requested services are unavailable at SHC o o You may make an appointment with the provider who is recommended by the requesting physician. An additional offsite referral is not required as long as the services are received within the referral time limit and are related to the same diagnosed condition. 10 4. Can I go to a health care provider other than the one named on the referral? Yes, as long as the provider is within the same specialty for treatment of the named condition. Please keep in mind that in some cases the SHC provider authorized services for a specifically named provider because his/her particular training is important to your proper treatment. Discuss with your SHC provider the impact a change in providers will have on your treatment plan. 11 PATIENT ACCOUNTS / BILLING Why did I receive a bill from Quest Diagnostic Lab? Laboratory tests other than those listed under No Cost to All Matriculated Students on the Sample of Services Chart will be billed by the laboratory to the insurance company or student if no insurance information is on file. Most plans do not provide 100% coverage for laboratory tests. Therefore, the student may be responsible for a co-pay or co-insurance. Please review the benefits portion of your health insurance policy to determine the amount of coverage available. 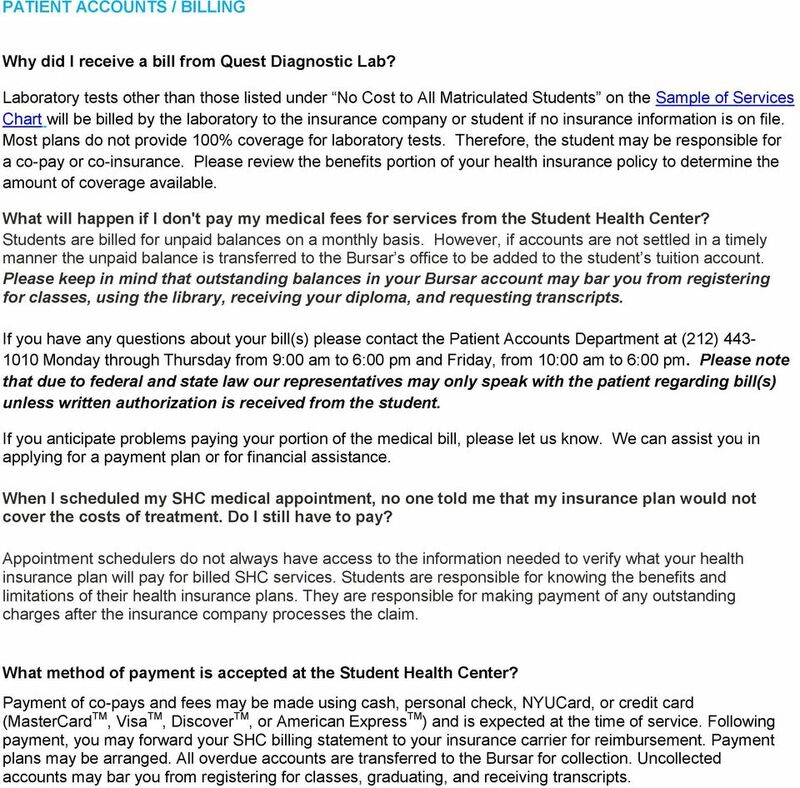 What will happen if I don't pay my medical fees for services from the Student Health Center? Students are billed for unpaid balances on a monthly basis. However, if accounts are not settled in a timely manner the unpaid balance is transferred to the Bursar s office to be added to the student s tuition account. Please keep in mind that outstanding balances in your Bursar account may bar you from registering for classes, using the library, receiving your diploma, and requesting transcripts. If you have any questions about your bill(s) please contact the Patient Accounts Department at (212) Monday through Thursday from 9:00 am to 6:00 pm and Friday, from 10:00 am to 6:00 pm. Please note that due to federal and state law our representatives may only speak with the patient regarding bill(s) unless written authorization is received from the student. If you anticipate problems paying your portion of the medical bill, please let us know. We can assist you in applying for a payment plan or for financial assistance. When I scheduled my SHC medical appointment, no one told me that my insurance plan would not cover the costs of treatment. Do I still have to pay? Appointment schedulers do not always have access to the information needed to verify what your health insurance plan will pay for billed SHC services. Students are responsible for knowing the benefits and limitations of their health insurance plans. They are responsible for making payment of any outstanding charges after the insurance company processes the claim. What method of payment is accepted at the Student Health Center? Payment of co-pays and fees may be made using cash, personal check, NYUCard, or credit card (MasterCard TM, Visa TM, Discover TM, or American Express TM ) and is expected at the time of service. Following payment, you may forward your SHC billing statement to your insurance carrier for reimbursement. Payment plans may be arranged. All overdue accounts are transferred to the Bursar for collection. Uncollected accounts may bar you from registering for classes, graduating, and receiving transcripts. Understanding Your Medical Bill THANK YOU for choosing University of Maryland Medical Center (UMMC) as your healthcare provider. We are committed to providing excellence in the delivery of healthcare. Student Health Insurance Plan Information 2014 2015 Welcome to the Student Health & Wellness Services (SH&WS) Cleveland State University offers health care to all students of the University community. AUBURN MEMORIAL MEDICAL SERVICES, P.C. AUBURN MEMORIAL MEDICAL SERVICES, P.C. Office Policies We would like to thank you for choosing as your medical provider. We have written this policy to keep you informed of our current office policies. We also post important information in the Every Friday Email, which will be sent to your artist email account each Friday. GROUP UNIVERSAL LIFE (GUL) & ACCIDENTAL DEATH & DISMEMBERMENT (AD&D) PROGRAM FREQUENTLY ASKED QUESTIONS (FAQs) MAY 2015 Minnesota Life is the underwriter of the State of Delaware s GUL and AD&D Program. Physical Therapy Aide P r o g r a m B r o c h u r e Get the training you need to earn your Physical Therapy Aide certificate and you will be ready to find a more challenging and rewarding career today! All About Veterans. Frequently Asked Questions.